Andrew Putnam entered the back nine with a one-stroke lead over Matt Kuchar in the final round of the Sony Open. Kuchar posted his ninth Tour victory. Runner-up Putnam earned $691,200. HONOLULU – Matt Kuchar didn’t have the start he wanted Sunday in the Sony Open, not with three bogeys in five holes after making just one through the first three rounds. The finish was much better for the 40-year-old. Kuchar seized control late in the round with back-to-back birdie putts, the second one on No. 16 prompting a rare show of emotion with a fist pump. And when he tapped in for a birdie and a four-shot victory over Andrew Putnam, who is from University Place, Kuchar looked back at a rainbow stretching across the sky. “It was too cool to have a rainbow appear on the 18th hole,” Kuchar said. Kuchar overcame his sloppy start with excellent play the rest of the way — he putted for birdie on the last 13 holes — and pulled away during a critical three-hole stretch at Waialae Country Club for a 4-under-par 66. He became the first multiple winner on the PGA Tour this season. Kuchar, who has nine Tour victories, finished at 22-under 258 and earned $1.152 million. Putnam, 29, had a one-stroke lead entering the back nine and closed with a 68. His bogey on the 14th hole became more costly when Kuchar sank 12-foot birdie putts on the 15th and 16th holes. Putnam, who won the Barracuda Championship last summer and was runner-up to Dustin Johnson at the FedEx St. Jude Classic, moves into the top 50 in the world for the first time in his career at No. 45. 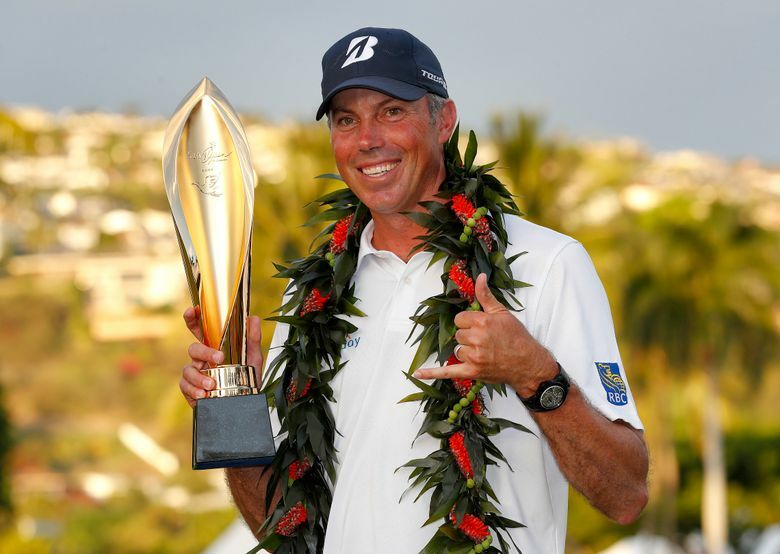 This is the second time Kuchar has won twice in the same season. He took the Match Play Championship and the Memorial in 2013. “I want to see how great this year can be,” Kuchar said. Kyle Stanley (65) of Gig Harbor and former Washington Husky Joel Dahmen (67) were among the players tied for 22nd place at 10 under.